Declared a Unesco biosphere reserve and unspoilt by mass tourism, La Palma is considered the most beautiful of the Canary Islands. Known as ‘La Isla Bonita’ (the pretty island), it is the most north-westerly of the Canaries, draped with green hills and teeming with structural masterpieces. In the capital, Santa Cruz, stands the wonderful Santuario de la Virgen de las Nieves, a 17th Century church featuring an intricately carved ceiling and glistening chandeliers. Inside is a fascinating 14th Century sculpture of the Virgin Mary, the oldest religious statue in the Canaries. Make sure you bring a camera when visiting Santa Cruz, especially the Old Town. Here you’ll come across stunning 17th Century plazas, chapels, forts and other late renaissance architecture. La Palma has the perfect scenery for mountainside walks, as it has many long, winding paths. There is road access from sea level to the 2,400m summit, where you’ll find one of the world’s finest astronomical observatories. The island is also home to the most diverse plant life in the Canaries and several indigenous animals such as the Western Canary goldcrest and La Palma giant lizard and chaffinch. Known for its excellent bananas, there are many farms in La Palma, particularly in the valley of Los llanos de Aridane. Be sure to sample other local produce like oranges, grapes and avocados, as they grow extremely well in the volcanic soil. 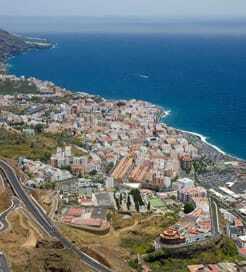 You can get to La Palma by ferry from most of the Canaries and from southern Spain. Tenerife and La Gomera are the closest islands, therefore, fast crossings are provided almost every day. However, travelling from Lanzarote and Gran Canaria takes a little longer with just a couple sailings each week. The crossing from mainland Spain is operated by Transmediterranea, whose fleet specialises in long distance journeys. From Cadiz, it’s a leisurely two and a half day journey, with the highest level of comfort and enjoyment guaranteed. For more information, please visit our Ferries from Tenerife to La Palma page. For more information, please visit our Ferries from Lanzarote to La Palma page. For more information, please visit our Ferries from Spain to La Palma page. For more information, please visit our Ferries from Gran Canaria to La Palma page. For more information, please visit our Ferries from La Gomera to La Palma page.